Born in 1900 to Reverend Dr. Cleland Boyd and Harriet Brown McAfee at Park College, Missouri, Mildred H. McAfee was surrounded at birth with the influences that would fill the rest of her life: faith and education. The daughter of a clergyman, and born at the college her grandfather founded, McAfee combined religion and learning from her earliest endeavors. She grew up in Parkville, Missouri, and as an adolescent moved with her family to Chicago where she prepared for college at the Francis W. Parker School. At Vassar, McAfee studied economics, sociology, and English, while filling her free time playing on her class’s hockey and basketball teams and working with the college’s Christian Association, the debate team, and student government. She served as the president of her class the second semester of her junior year, and, in her senior year, as president of the Christian Association. Graduating as a member of Phi Beta Kappa in 1920, she built a reputation as a devoted and able student and an enthusiastic campus leader. After graduating McAfee taught elementary and middle school aged girls in her home state for three years. In the fall of 1923, she left Illinois to become an acting professor of economics and sociology at Tusculum College in Greenville, Tennessee. Studying at the University of Chicago during the summers, McAfee earned her M.A. in Sociology in 1928, moving to Centre College in 1926 to become Dean of Women and professor of Sociology. McAfee remained at Centre until 1932, when she returned to Vassar as the Executive Secretary of the Associate Alumnae of Vassar College. In her new position, McAfee helped raise the necessary funding for the construction of Kenyon Hall and became involved in revisions to the school’s social regulations. McAfee's goal was to give Vassar women more independence. Two years later, McAfee accepted the position of Dean of College Women at Oberlin College. By the time she had reached Oberlin, McAfee had gained a diverse background from 14 years in educational administration. In 1936, Wellesley College ended an 18-month search involving over 100 candidates, by naming 36-year-old Mildred McAfee, a woman possessing “intellectual honesty, leadership, tolerance, savoir-faire, sympathetic understanding of youth, vision, and a sense of humor,” as the new president of Wellesley College. As president of Wellesley, McAfee had the opportunity and the authority to put to work what she had learned from four different institutions of higher learning. Her presidency emphasized truth as the greatest and most precious object of scholarly pursuit. McAfee also defended the validity of a liberal arts education against accusations of impracticality and indulgence during the great depression. She considered it valuable in building the power of the individual and in shaping a greater internal and external awareness of the world. McAfee subscribed to the belief that the liberal arts cannot be taken as preparation for a career, but as preparation for life. As some one especially concerned with women’s education, she considered this type of learning invaluable toward social equity. "I envisage the function of this college, or any college, to prepare an oncoming generation of students to disseminate truth. It is my conviction that truth is more easily given a hearing if it is presented by a healthy, well-adjusted, effective human being who sees the truth in the light of a world-philosophy which gives it meaning." In August of 1942, as the United States was strained for manpower upon entering World War II, McAfee took a temporary leave of absence from the college to serve as director of the Navy’s newly established WAVES. Members of the Naval Reserve, WAVES (Women Accepted for Volunteer Emergency Service) took over many of the domestic positions necessary during wartime in order to free male officers for combat. As director of the WAVES, McAfee was appointed to the rank of Lieutenant-Commander, becoming the first woman to be commissioned as an officer in the United States Navy. 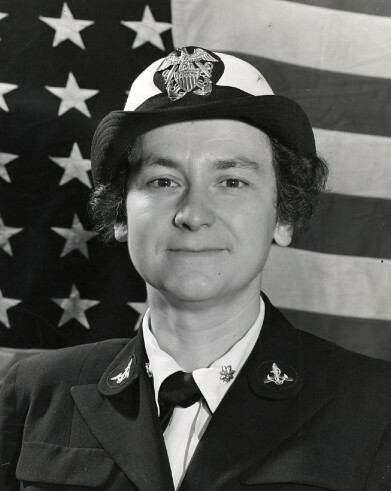 She remained with the WAVES until 1945, was promoted to the rank of Captain, and received the Distinguished Service Medal for her work as Director of the Women’s Reserve. Upon her return to Wellesley, McAfee, at the age of 45, married the Reverend Dr. Douglass Horton, dean emeritus of the Harvard Divinity School and Minister of the General Council of Congregational Christian Churches. The new Mrs. Horton continued her successful administration of Wellesley, retiring in 1948. After retirement, McAfee pursued her other passion in life, her religious faith. She devoted herself to working with her husband in church and civic work and was also an active leader in education and social reform. Having written her master’s thesis on the “The Young Women’s Christian Association; a Case Study of a Religious Movement,” McAfee was interested in the role that religious organizations could play in the world, and she worked as an influential member of the General Council of Congregational Christian Churches. She considered religion a tool that could bridge gaps, something capable of bringing a greater understanding to people through common devotion, whether Catholic, Protestant, Jewish, or Muslim. She served as a UNESCO delegate, was a director of the New York Life Insurance Company, the National Broadcasting Company, Radio Corporation of America, and the Ford Foundation's Fund for the Advancement of Education, and later co-chaired the National Women’s Conference on Civil Rights. McAfee’s husband died in the couple’s northern New Hampshire home in 1968. She continued her social and religious work until 1994, dying at the age of 94. At the time of her death, McAfee had more then 31 honorary degrees for her achievements.